From a galley big enough to call a kitchen to hand-crafted interiors and plenty of stowage inside and out, the Antares is built for liveaboards. 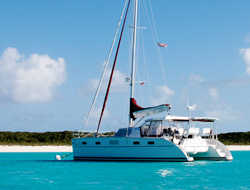 The Antares 44 is truly the world's best liveaboard sailing catamaran. Qualities like a luxurious wood-finished interior, a large galley with plenty of storage, design features built to protect the owner in any conditions, and a well equipped standard equipment list make the Antares a well-sought after vessel. 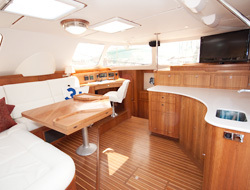 Because many other catamarans are built for charter, they typically use wood accents inserted into heavy fiberglass molds. However, as with all true luxury yachts, the Antares' interior is hand-crafted using high-tech, lightweight honeycomb board sandwiched between cherry veneer. And yes, the galley is big enough to call a kitchen! With substantially more storage and counter space than other yachts of its size, the Antares galley is designed to provide a bright and open work area with extensive counters inboard and outboard, proper counter tops, gourmet kitchen fixtures and stainless backsplashes throughout, making the fit-out a rival to many higher end kitchens. And while the luxurious hand finished interior is designed for beauty and comfort, its light-weight construction means Antares doesn't compromise performance and doesn't have to overcompensate with the size of the rigging. A smaller rig can be easily managed by a cruising couple, at all times. It also means that with a 61’ mast height, you can clear the majority of bridges along the Intercoastal Waterway and can continue to cruise in protected waters along the East Coast of the United States in poor weather conditions.